Comic Times has a spectacular looking 2 part series coming out. They sent us the covers for the first issue. Take a look and read all about, order it! From Blood…..
“Patient 27 has a secret, if you want to know what it is . For ten years the man known only as Patient 27 has sat in his cell at the Grove Mental Hospital. For ten years he has spoken to no one only occasionally lashing out in violent rages. Doctor Ashley Reese is determined to break his silence and discover what secrets he has been hiding. But is she ready to face the truth about her patient and herself? More importantly, is the world ready to discover what this mysterious man is capable of? Based on a story by James Whynot, written by James Whynot and Zach Bassett with Martin T. Pierro, From Blood is an action packed, violent psychological thriller that will keep readers on the edge of their seats. From Blood issue 1 (of 2) – is a 31 page black and white comic published by the South Florida based studio Cosmic Times, featuring art by Zach Bassett & James Whynot. 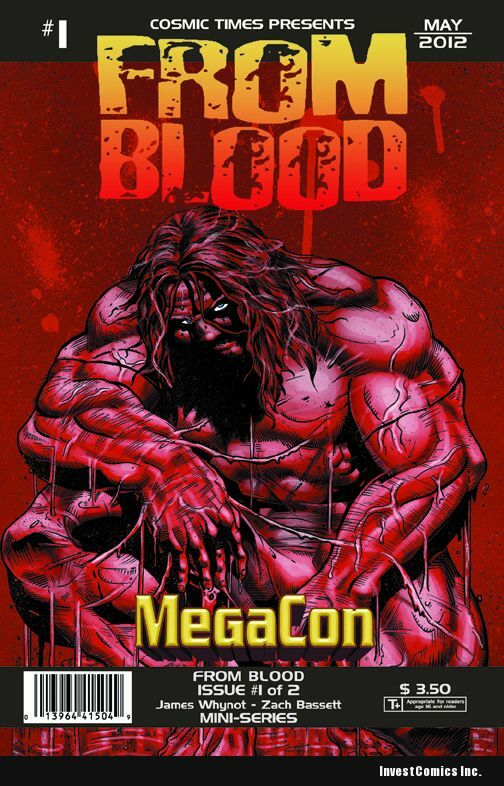 Issue 1 will debut at MegaCon in Orlando, Florida on February 17th 2012 with a limited convention exclusive edition featuring a full color cover by Larry Watts. 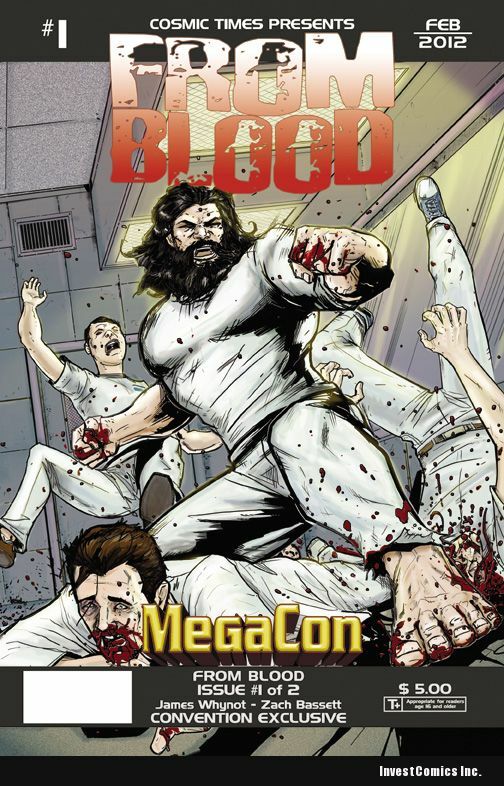 A few months after its debut at MegaCon, From Blood will be released nationally with a “regular” cover by Zach Bassett. Preorders for the MegaCon edition are currently being taken at – www.CosmicTimes.net. Established in 2009, Cosmic Times has become a small-press favorite with such diverse titles as Arthur: The Legend Continues, Decisions and Souled. Publisher Martin T. Pierro (who named Cosmic Times after a fanzine he published back in the mid 80s while still in middle school) is continuing to focus on his goal of making Cosmic Times into a true independent publishing house that focuses on quality storytelling. Colorado native, Zach Bassett attended the Savannah College of Art and Design (SCAD) where he graduated with a BFA from their Sequential Art program. Prior to co-creating From Blood, Zach had worked on two other projects for Cosmic Times; Souled and Decisions. (Zach is also currently writing the third issue of Decisions.) Zach has recently completed the critically acclaimed No West to Cross for 215 Ink and has been working with Bluewater Productions on their biographical line of books, the most recent was a Bill Gates biography written by Martin T. Pierro. James Whynot attended the Savannah College of Art and Design (SCAD) where he developed the concept for From Blood. Teaming up with his schoolmate Zach Bassett, James brought From Blood to Cosmic Times after working with Zach on the sci-fi mini-series Souled. Beyond his work with Cosmic Times, James has worked with FacePalm Comics and recently signed with Miami based studio Creature Entertainment to work on their new series TS-101. James has also done work for 803 Studios, Bluewater Productions and Arcana Comics. The MegaCon exclusive cover marks Larry Watts’ first work with Cosmic Times, but he is no stranger to the comic’s industry. Larry has worked various projects for Alterna Comics, Top Shelf 2.0, Insomnia Productions and most recently Frozen Beach Studios. Larry is also working as Art Director on a project for IDW/Frozen Beach entitled The Pond – Horror Business. Before delving into the world of comics, Larry worked in advertising working on campaigns for Anheiser-Busch and other large accounts earning several ADDY awards in the process. Next HESTER BEGINS THE COUNTDOWN TO DARKNESS 100!